If you’ve been watching the BBC’s television show Great British Sewing Bee, you probably know Charlotte Newland, who was announced as the winner on July 4! Charlotte is an individual MQG member from London, and one of 10 contestants on this year’s show. She made it through eight weeks of tough sewing challenges to become Britain’s best amateur sewer of 2016. 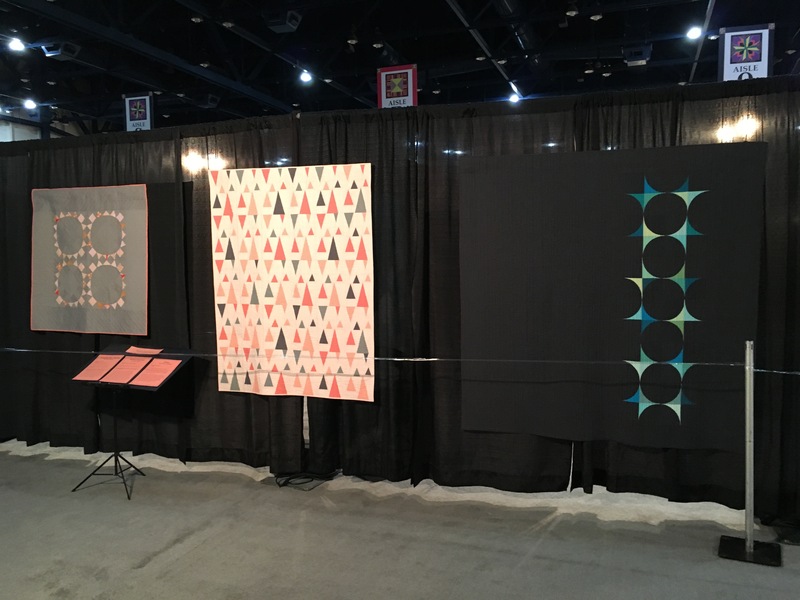 We caught up with Charlotte to talk about the Bee, modern quilting, QuiltCon and the MQG. Hi Charlotte — and congrats! We’re so excited for you. When did you decide you wanted to apply to be on the show? My kids and I had always watched the show together, and last season my girls in particular kept telling me I should apply. They were so excited to see that applications were open, and made sure I filled in the form! What happened when they told you you had been accepted? The application process was pretty drawn out — there were several stages to go through and it was about four months before I heard I had been accepted. By that time I had gotten to know the people in the production company pretty well, so when they called with the news there was a lot of excited squealing. Did you watch the episodes as they were airing? Any funny fan moments that happened as the show progressed? I watched the episodes as they were shown, every week. It was really interesting to see the bits that we hadn’t been aware of at the time, like the judges’ discussions. The editing team did an amazing job cutting down probably 100 hours of footage into a one hour show. I did get recognised from about episode two. I was walking across Tower Bridge one day and someone called out “Oooh! You’re the lady from the sewing bee!” It was so strange to be recognised! 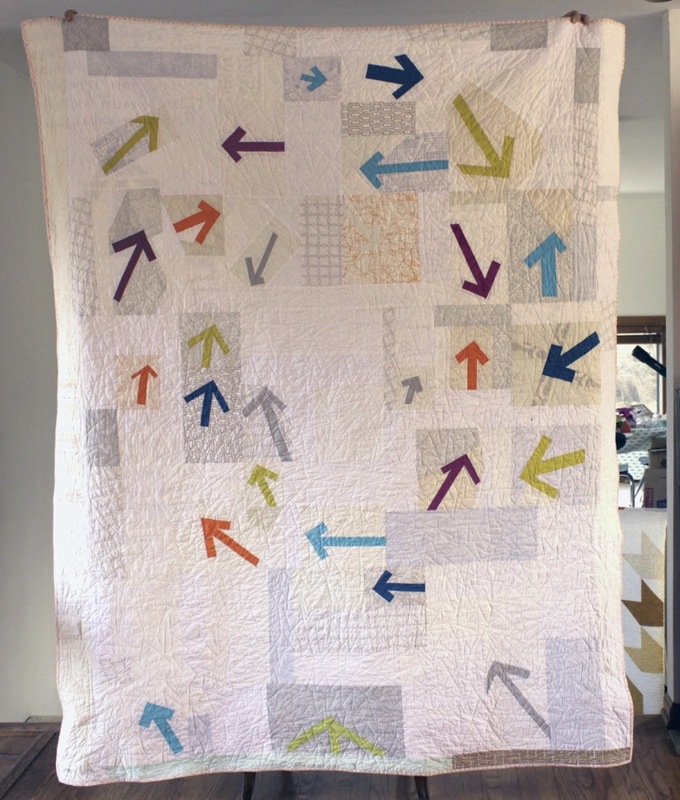 Does your quilt experience influence the way you design and create garments? It was definitely an advantage to have good rotary cutting skills, especially bearing in mind that the challenges were timed. Pinning and using scissors is so much more time consuming than using weights and a rotary cutter. It’s also a lot more accurate when cutting out stretch or delicate fabrics. Rotary cutting FTW! During the ’60s week, your color block dress was lovely! And very reminiscent of a modern quilt… The judges were also impressed that you were trying out your fabrics ahead of time. Is that a quilter technique? Did any of the other challenges require you to reach into your quilting bag of tricks? Using fabric scraps to test out colour placement in the Mondrian dress challenge just made sense to me. It’s definitely something that I did because of my quilting background. I use a design wall a lot in my quilting, and this was a teeny version of the same concept. The time I’ve spent matching HST seams also stood me in good stead in the chevron top challenge in the first week! Is your garment design style similar to your quilt style? I am primarily an improv quilter, and I think that the “chop it up randomly and sew it back together” approach was really helpful in the alteration challenge, particularly with the duvet cover in the semi final. What was it like being critiqued by Esme and Patrick? As an amateur sewer I’ve never been critiqued before (apart from by myself, of course! ), and it took a bit of getting used to. The judges were extremely fair in all their comments, though, and really kind about how they said things even when there were serious issues. Getting a good review felt amazing – like winning a prize! It seemed like all the contestants became good friends during the season! Are any of them also quilters? We had so much fun in the sewing room, and we learned so much from each other. Because we are all amateurs we each had a different approach, so there was a lot of skill sharing. I love them all to bits, and wish that we lived closer. Joyce is the only other quilter in the group. The MQG community has been cheering you on the whole season — what was it like knowing that 10,000 people were rooting for you? You were going to attend QuiltCon last year, but couldn’t because of filming. What was your reaction when you found out the two would overlap? 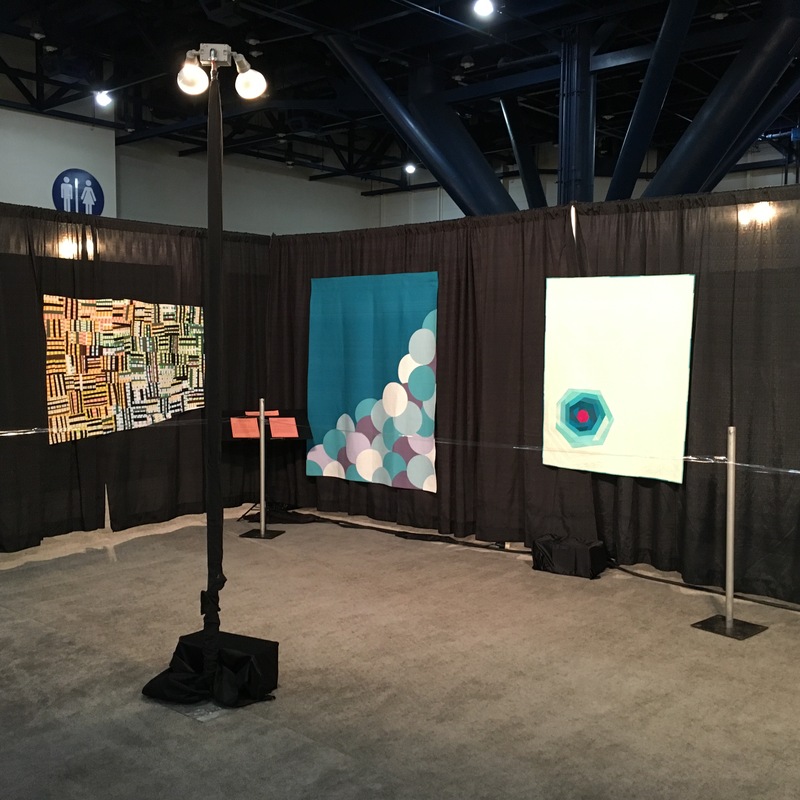 I couldn’t believe it when I found out that filming would coincide with QuiltCon! I was so looking forward to coming to Pasadena, it was crazy that both things happened at the same time! Are you working on any quilts or is it just garments for the time being? I’m working on a solids improv quilt inspired by the art of Sonia Delauney. It’s been a bit neglected over the last few months, but I hope to get some work done on over the summer. I’ve also got loads of clothes I want to make, including a new swimsuit. What do you plan to do with your sewing time now that you’ve won the Bee? I am looking forward to sewing just for me again. During the Bee there really was no time to sew anything for myself. Will we see you at QuiltCon 2017 in Savannah? I plan to be there as crew — I’m just looking into flights now! What is the best part of being an MQG member? The MQG community! I’ve met so many fantastic people online and in real life, and everyone is so supportive. It’s really wonderful! First off, please let me say how proud I am of all the members who contributed to this quilt. When I proposed this project, I got some grumblings from the group. Apparently, improv quilting is not our favorite! But, I think we all can agree – the end product was totally worth it! To prepare for this challenge, our guild reviewed some basic improv techniques by watching the MQG webinar “Improv with Intent” and discussing how we as individuals could create blocks that were improvisational, but still form a cohesive quilt. We decided a quilt with six individual blocks, each with its own theme would work best for our group. From there the guild broke up into six teams and created individual postcards. This was a great program for our guild as it allowed for sewing time, and time to get to know other members. We also very quickly learned who was not a fan of unstructured cutting and sewing – me for one! It was definitely a challenge for some of us. Others had issues with the limited color palette, but we all got over our fears quickly. And another big thanks to Vicki for quilting and binding. It looks amazing! 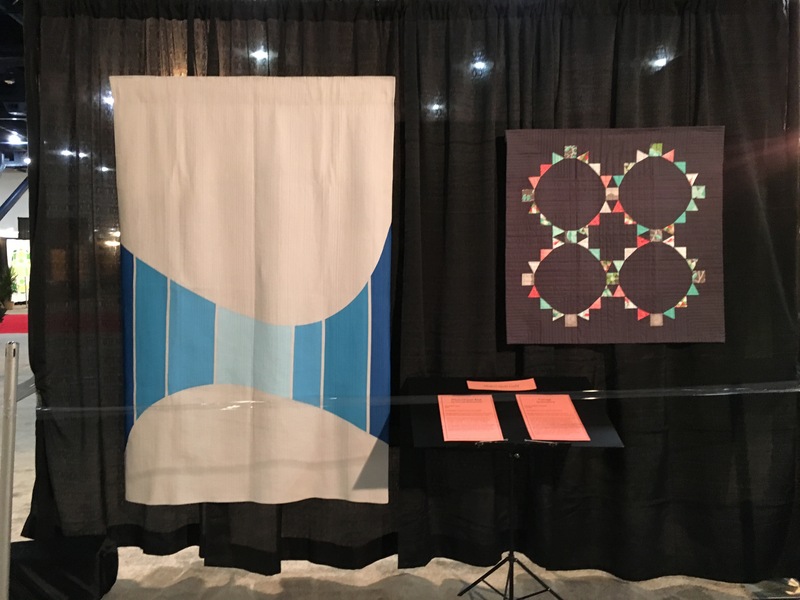 When this quilt returns from the show, we plan to vote on a charity that will receive it. I’m sure whoever the final recipient is will treasure it. I know I’m honored to have been part of the group who made it. The Hillsboro carpool gals (eight of us from Portland MQG and one deserter now with San Antonio MQG) agreed to do this challenge, and once we decided to make improv stars, off we went. One of us purchased Kona solids per the predetermined color palette. Each of us could add any solid or print that matched the chosen colors and made three stars each finishing at 3.5″, 6.5″ and 9.5″. PMQG has Sew Days at Fabric Depot, so we met two consecutive months with a plan in mind, then one last time at a member’s home. One member made the back from scraps, another quilted it, and then another bound and applied the sleeve. Probably the thing we learned in this challenge was about each other. Our carpool ride is usually 1.75 hours getting to the meetings, and an hour back, but we spent a lot more time together on this quilt. It was great having one member not sewing and moving the blocks around and giving direction. Occasionally, we would all break and get a consensus. 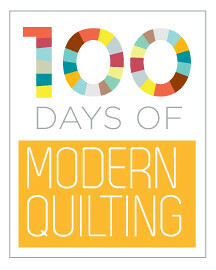 For me, I love the name of the quilt and that we met the deadline and will get to show it off at PMQG next Thursday. Important to all of us was to use fabric from fellow PMQG members: Elizabeth Hartman, Mo Bedel, Violet Craft and Monica Solorio-Snow. 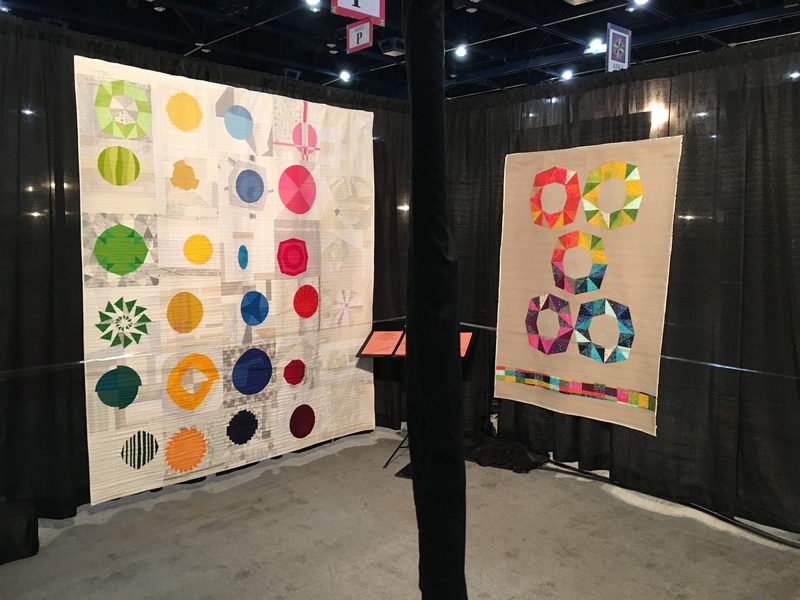 The QuiltCon 2017 blog button is here! 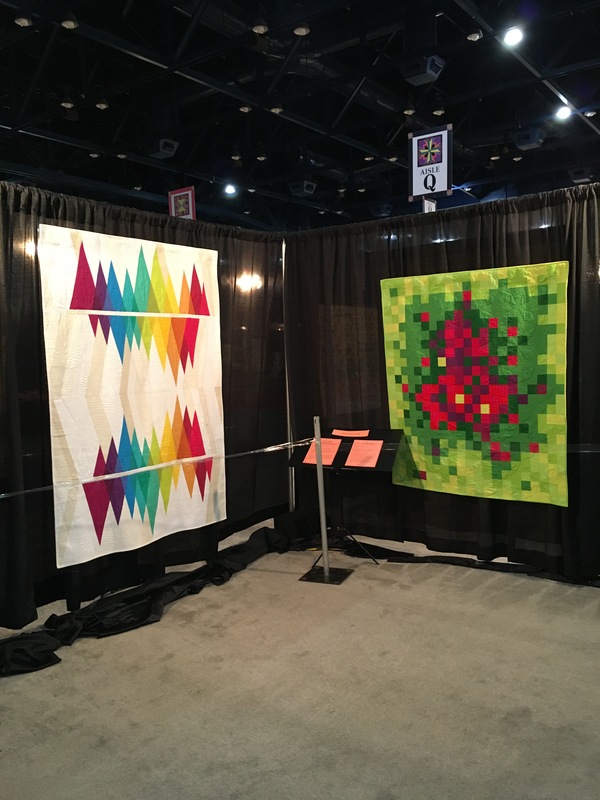 Going to QuiltCon? Grab a blog button! Just copy and paste the code below and add it to your blog. You can also grab this and share on social media if you’re so inclined. Don’t forget to use #quiltcon — the official hashtag for all QuiltCon events. South Florida MQG is a newly formalized guild — we took the leap and joined the MQG midway through 2015. Prior to that we were an informal group meeting once a month in our local quilt shop, the wonderful Stitchcraft of Boca Raton. Most of our members are new to modern quilting, coming either from a traditional quilting background, or being entirely new to quilting. Our very first workshop was an improv round robin, and it was a joy to see the gusto with which everyone abandoned their rulers and threw themselves into improv! So we were pretty excited about the idea of a group improv with intent for this challenge. SFMQG covers a large land mass — a part of Florida that stretches from Palm City to Miami! Due to our members being so spread out, it can be a challenge to organize time to work together as a group on a sewing project. For this reason, we decided to work on individual pieces of the quilt. Many of us have been profoundly influenced by Sherri Lynn Wood’s wonderful Improv Handbook, and following her lead, we identified the steps we wanted to follow for this project. In fact, the first step was done for us by the MQG — the colors, which were part of the challenge framework. These colors really spoke to us: a Florida sunset! We have glorious, dramatic sunsets in this part of the world – the blue skies melding into the golden and crimson sun on the dark horizon over the sea. The colors were a gift for us! We then limited ourselves to five colors, and we restricted our patchwork size by limiting the amount of fabric available to each participant (a fat eighth of each color). An important part of the process for us was to make it easy for everyone to participate. For many of our members, working on this quilt would be their very first hands-on attempt at improv. I gave a presentation at a meeting which was aimed at removing some of the fear and loosening up the death-grips on those rulers. 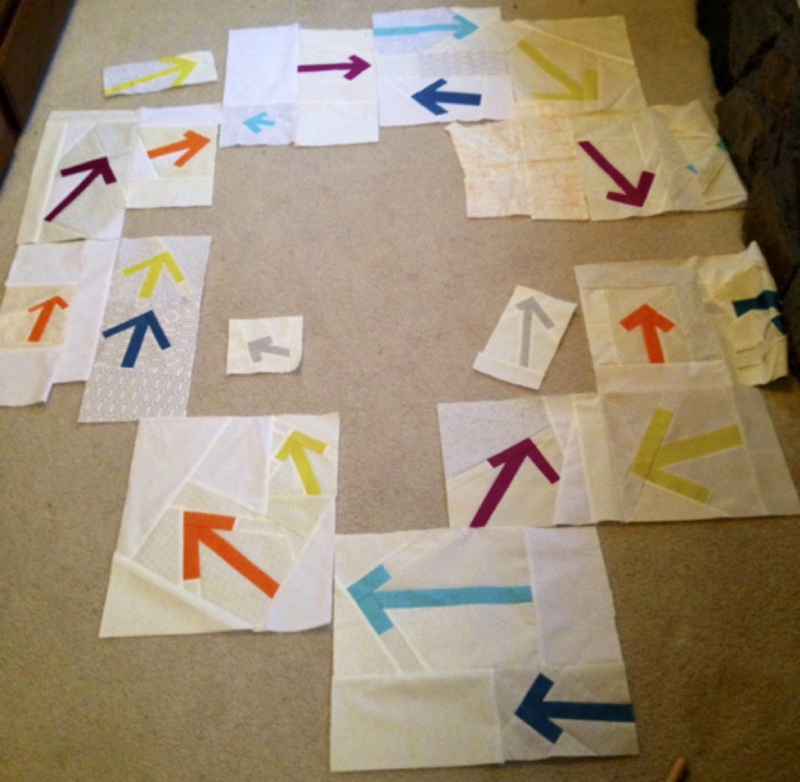 I then devised a step-by-step process for the patchwork which I hoped would make everyone comfortable. The instructions were specific enough to give the terrified a guide rope, but loose enough to allow the more confident to base jump right into the wild blue yonder. I deliberately did not include any photographs with the instructions, or post any tutorial photos, because I wanted imagination to take flight. We simply used that inspirational sunset as our guide, and used our scissors to create shapes to build our patchwork. I can not tell you how dumbfounded I was at our November meeting, as block after beautiful block turned up on the design board. A glorious wall full of colorful, abstract, improvised sunsets! As a guild, we knocked it out of the park. For our December meeting, we spent the entire afternoon sewing. We are lucky to have Tonya Ricucci, the Unruly Quilter and a master of improvisational piecing, in our guild. Tonya led the group in charge of devising a layout. They simply starting putting pieces together like a puzzle, fitting one patchwork section to another and building our quilt top. Another group improv-pieced a back for the quilt from the leftover fabric used for the top. A third group cut and prepared binding. We had two members pressing everything as we went. We pieced the top and back together that afternoon. 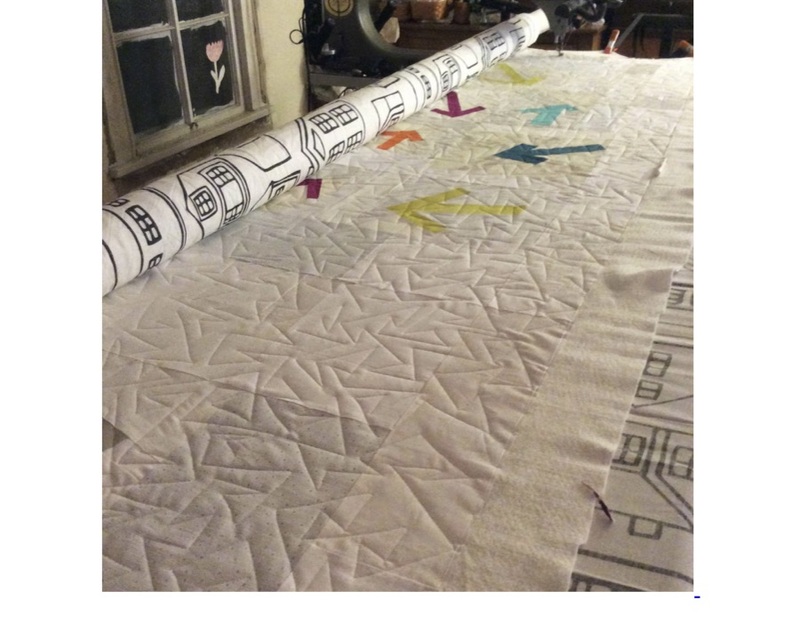 Our talented member Patti Auten did the free motion quilting in the following weeks. Charlotte Noll and Kerrilyn O’Rourke lent their talents to sew the binding and sleeve. It fills my heart with joy to see a such a new guild come together and complete this project. So much fearless creativity was harnessed and devoted to the completion of our quilt. 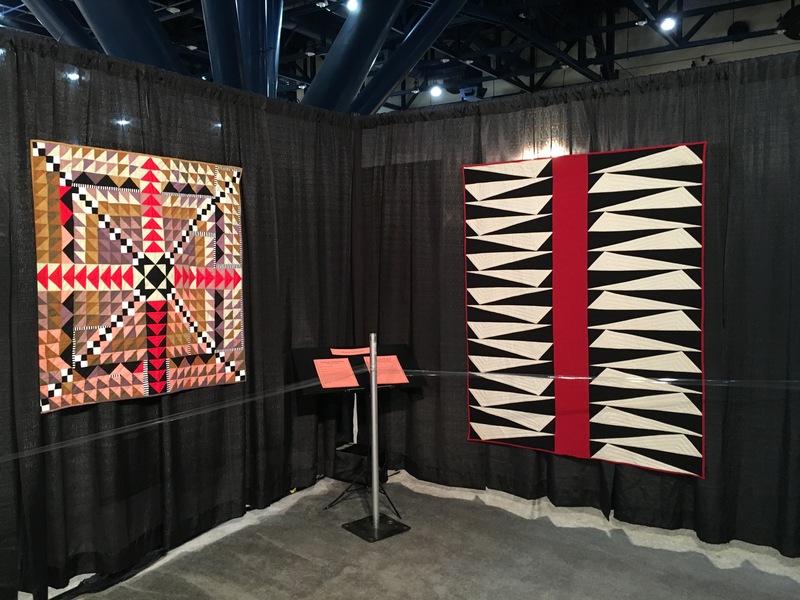 I hope that the visitors to QuiltCon enjoyed our work as much as we have enjoyed seeing the beautiful creations made by other modern guilds. There is something truly special about feeling part of a project that so many people around the globe have also been a part of. Thanks to the MQG for making this wonderful project possible! After reviewing the MQG prompts and video, the PHXmqg discussed what “Improv with Intent” means to us. We talked about the challenge that improvisational quilting brings to many sewing tables. We found that only one of our members truly worked with an improvisational direction in her quilting. More importantly was that many of the members were eager to learn but never knew how to approach this fantastic method! 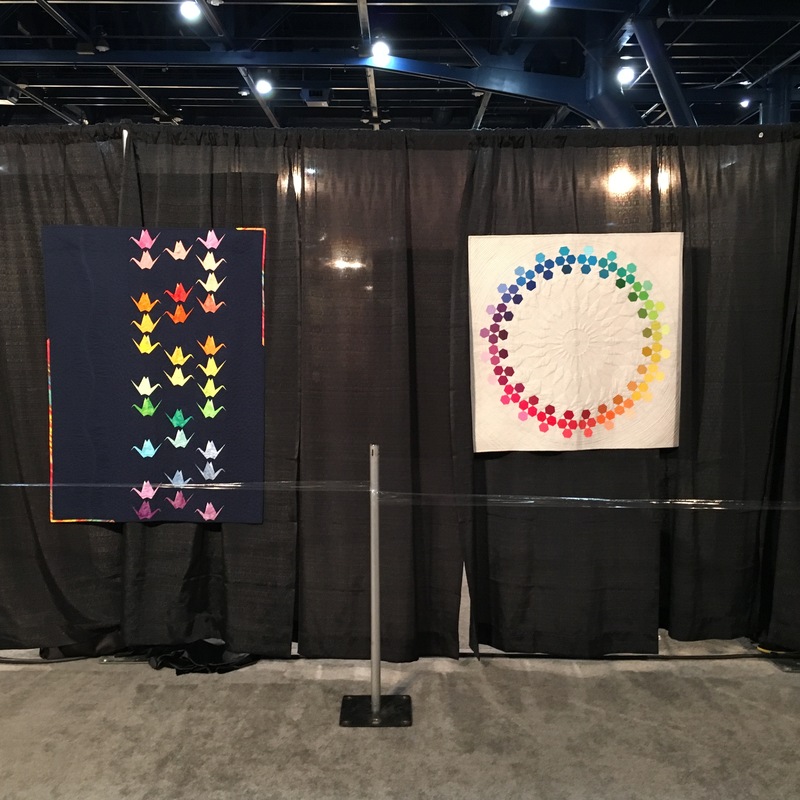 Our intent for the Quiltcon charity quilt journey was to take this wonderful opportunity to learn together and join our many varied backgrounds and improvising our way to become one solid, cohesive group. One member led a workshop on improv quilting as well as provided a home video where we could see the process and revisit the clip any time. The most important part of the process was to let go, have fun and, of course, have no rules! We tried to be concerned with only the moment and not so much the outcome. It’s easier to reign yourself back in but it is so much harder to break down the structure on our conventional quilt piecing. During our workshop, everyone was instructed to bring only rotary cutters and self-healing mats. Making that first random cut without a ruler was probably the most challenging step for those new to improv piecing. But once the first unmeasured cut was complete, the next came easier, and those that followed were even better! We experimented with curves, slicing, dicing and using tiny bits to create larger pieced segments. You could see the relieved, surprised and excited expressions of accomplishment all around the room! We had collected close to fifteen miscellaneous sized blocks. The project manager had permission to put them together and fill in the gaps to create one focus “fabric” for the quilt top. In the true improv method, the final design came from playing with the fabric until it reflected the group’s direction — togetherness. Once the top and back was complete, the quilting was balanced and simple. The quilt went to another member for binding where she had full reign to do what she liked. Finishing touches of the sleeve and label were done by our final member. We strive to have a learning environment within our guild; sharing our boundless talents and insights from all of our members. This group challenge was just one of many creative projects we have here in our Arizona guild. Our intent was to reach a very important, intangible and supremely crucial goal for our guild: to create a sense of cohesiveness within a chapter that is blessed with wonderful members from so many places — Alaska to Mexico, Connecticut to California. We are indeed a living form of a “quilt in the desert”! 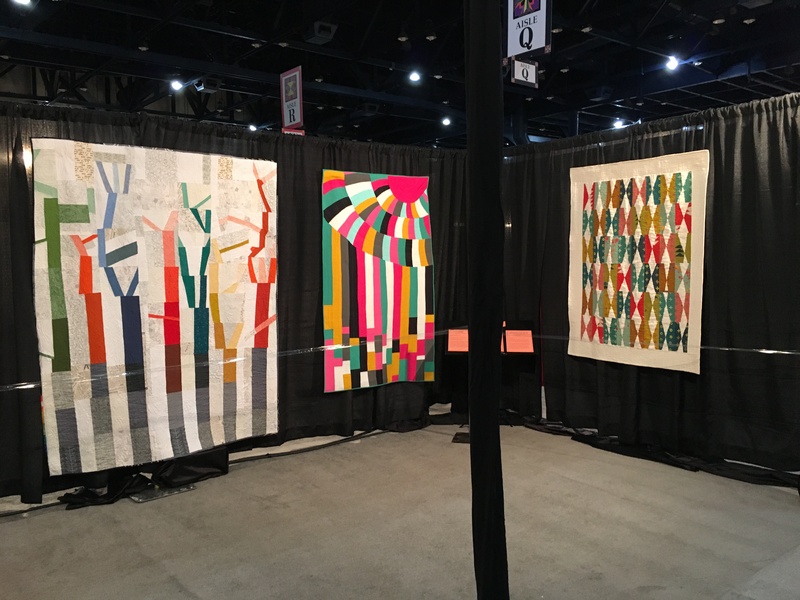 Last year the Modern Quilt Guild threw out a challenge for the 2016 charity quilts to be displayed in Pasadena. The challenge required participants to “work collaboratively to create completed quilts using a predetermined color palette and improv with intent.” Several members of the Denver Metro guild know a thing or two about improv, so we were eager to accept the challenge! The first step in our process was to choose a theme around which to construct our quilt so that it would still be cohesive. The theme that was settled on was “Trust.” Specifically, how does trust come into play when making a collaborative quilt? We trusted the MQG in their choice of colors, which included several neutrals and a few primary colors. Participants were then instructed to make an improvisational block using the neutral colors for their negative space and a simple four-sided shape with the black color trusting that there would be more direction to come. The third step was to put the pieced blocks into a bag, mix them up and draw out new blocks. Those blocks could then be altered using small amounts of the secondary colors using improvisation, curved piecing, slice and insert or whatever moved the maker, trusting the process while working together. Finally, the blocks were laid out with the intention of creating a focal point and some visual interest and movement through the use of the secondary colors and quilting. I think the result is a stunning success! An interesting point to make is that many of these blocks were turned on their corners in order to create the movement of the smaller secondary colored curves. It was like putting together a puzzle for which there was no picture. There are a lot of Y-seams in this baby! Let’s face it, improv can be intimidating for a lot of us quilters. We tend to like order, and lines, and rulers! However, when you quilt with intention, basing your ideas off of a set of guidelines it takes some of the intimidation off the table and turns out to be a lot of fun. We loved seeing how all the blocks, as different as they were, still fit together (in our minds) perfectly! We’re not sure yet where we’ll be donating our quilt, but we hope that it makes the recipient smile. 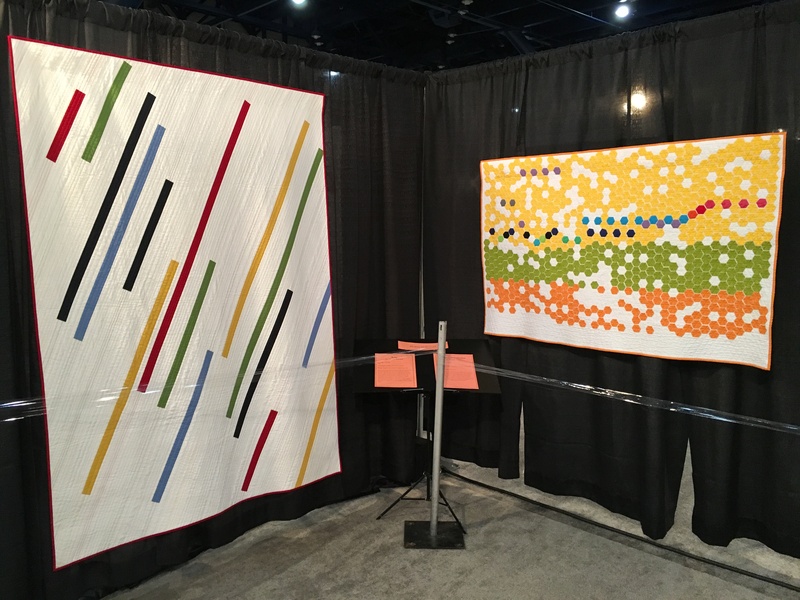 The women of the Denver Metro Modern Quilt Guild would like to give the following members thanks for their participation: Andrea Berryhill, Alaina Marler, Marsha Loewenberg, Chelsea O’Hayre, Katie Rapp, Shelby Skumanich, Rosalynda Turner, Amy Wade, and Emily Voytek. We would like to especially thank Stephanie Ruyle for trusting us with an amazing design concept and working on final construction, Wendy Bermingham and Christine Perrigo for the many hours of assembly, creating the back and the amazing quilting, Susan Sanstistevan for heading up the committee and Judy Sanclaria for binding the quilt. What a beautiful collaboration! 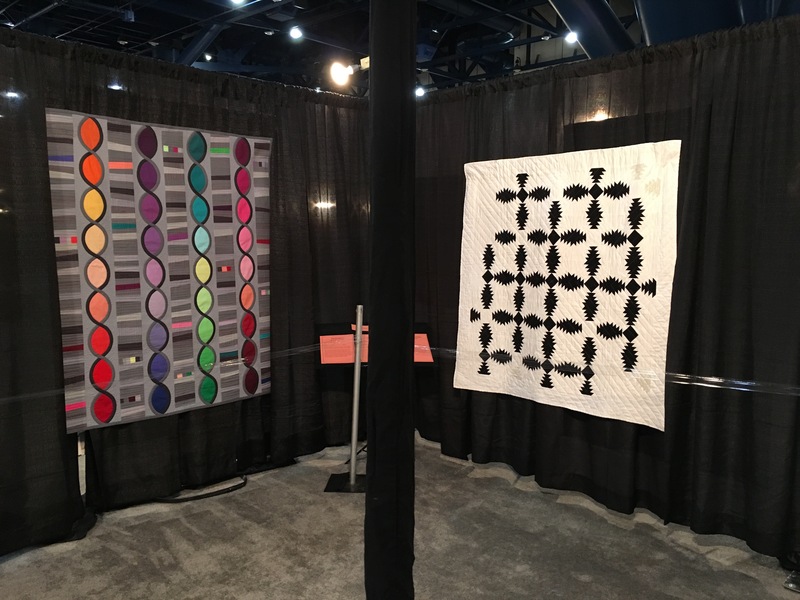 Congratulations to our QuiltCon 2016 winners! The competition was fierce this year, but these quilts stood above the rest. 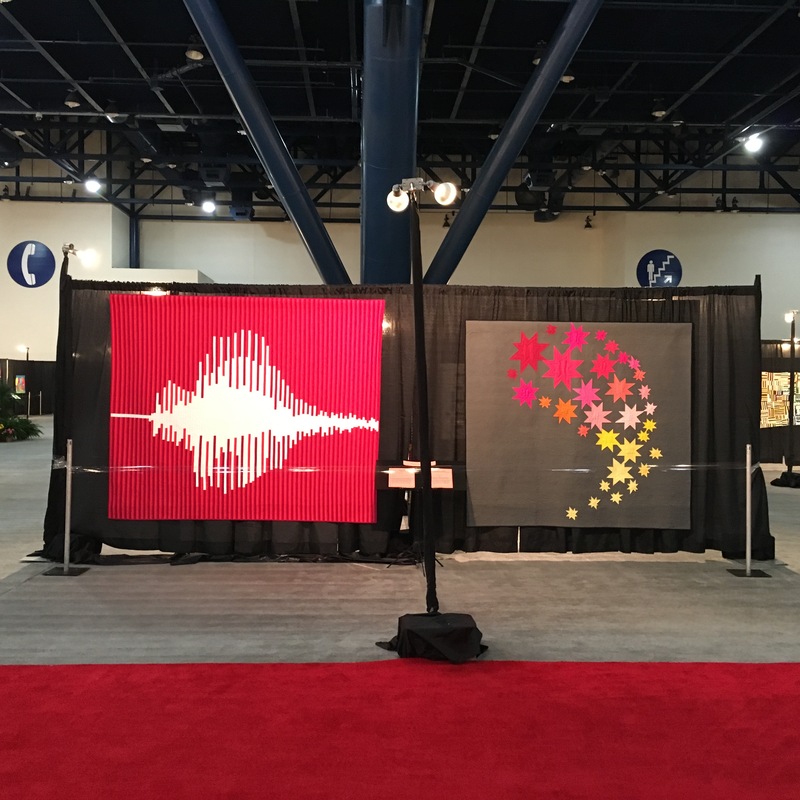 Congratulations to our 2016 QuiltCon winners! 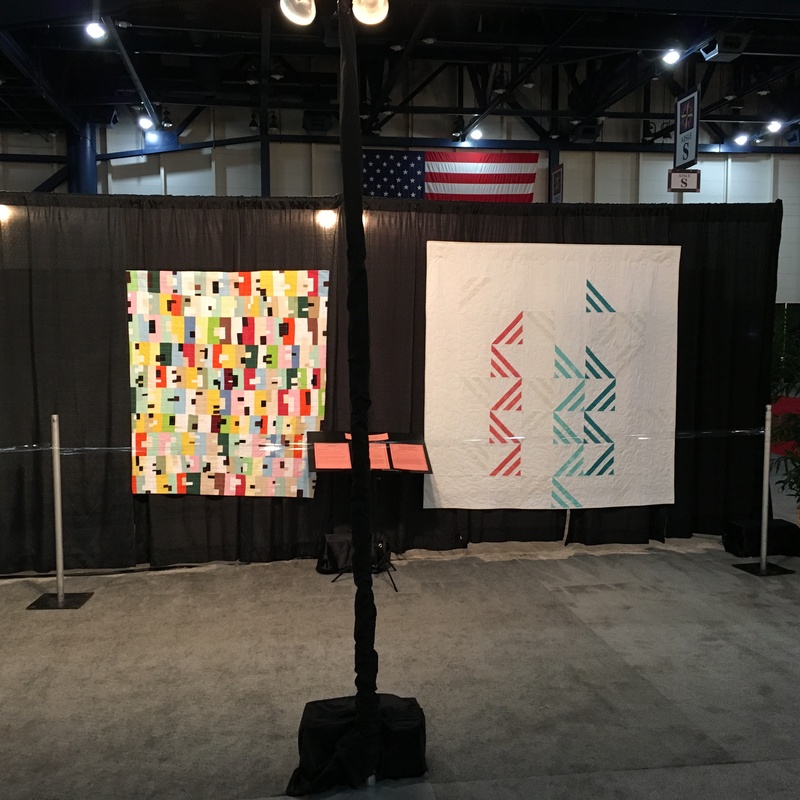 One of the great things about going to Quilt Market is getting the first peek at the MQG showcase at the International Quilt Festival! 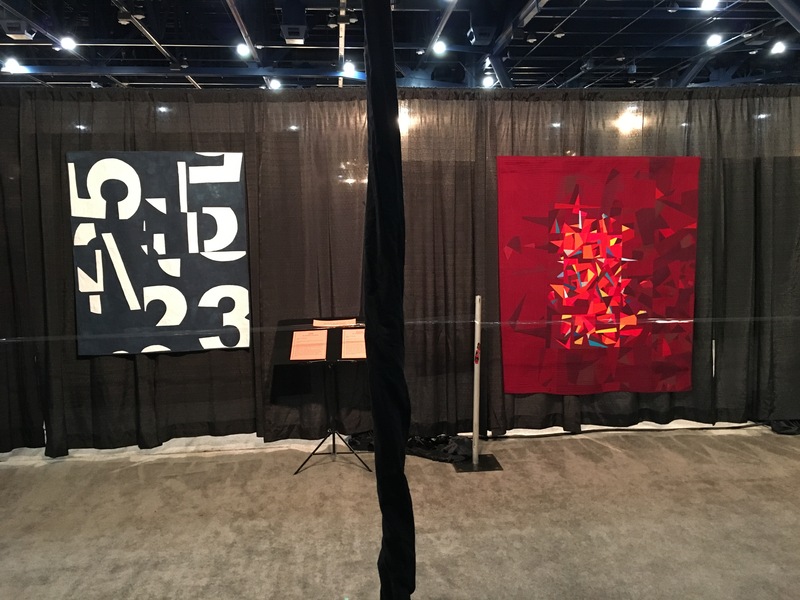 We had a stellar show this year with lots of diverse modern quilts. The photos below give a nice overview on how the show looks and feels. Best of all, all of these quilts will make an appearance at QuiltCon in Pasadena! The Ann Arbor Quilt Guild was very excited to participate in the QuiltCon Charity Quilt Challenge! We had enough interested participants that we decided to split into two groups: one where members would piece blocks based on a pattern, and another where members would piece blocks in an improvisational manner. The improv team started with an idea: a quilt inspired by ideas! 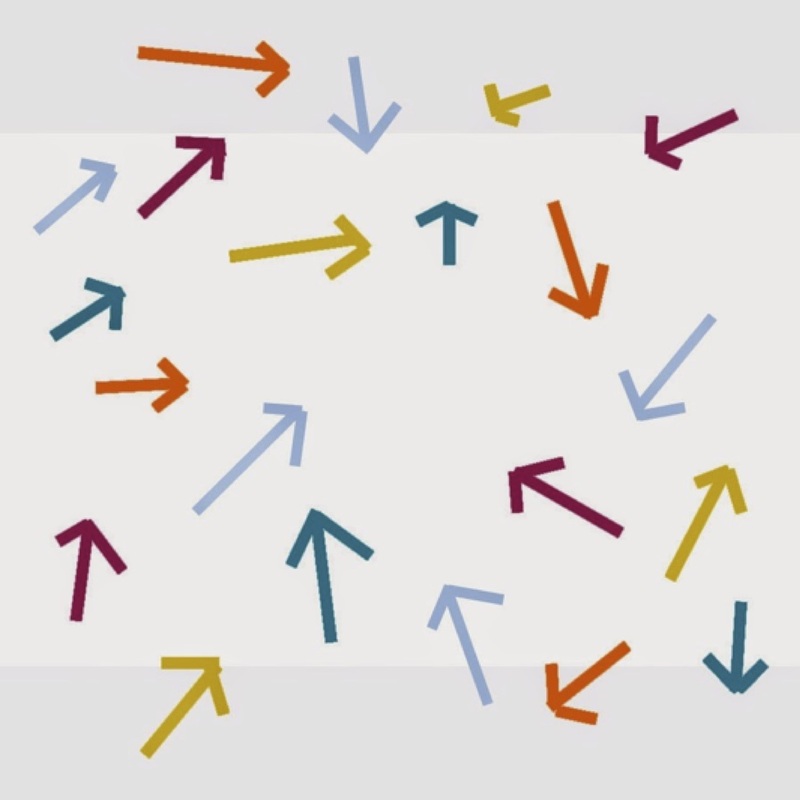 Arrows swarming and circulating represent the coordination of thought fragments. Arrows were made improvisationally. A tutorial was written by team member Jenna and can be found HERE. In accordance to the challenge guidelines, we forsook a traditional block format and rather used negative space and variable framing to give our arrows an alternate grid. This quilt was long-arm quilted by member Lynn Harris of The Little Red Hen. Our other group used their skills following the beautiful Think Positive pattern written by A2MQG member Debbie Grifka. Team members made gorgeous plus blocks that were then assembled into a stunning quilt top.